You see, my husband knows me well and he definitely knows that I do not like to run. I never have. I’m just not so inclined. I am more of a cheerleader. But Sheepdog is a runner. He is mostly a bike rider, but he is also a runner. Run, Sheepdog, run. He has been running throughout most of our marriage. No, not away from our marriage, silly. Throughout. Although, in truth, maybe sometimes he is dreaming of running away. I know I sometimes do. Just not while running. But I digress. Sheepdog has completed a couple of triathlons, but the swimming part always gets him. He swims like I would imagine a T-rex swimming… like he weighs in the tons and has disproportionately short arms. The triathlon I remember best he did in Brigantine, New Jersey, when Kid B was just an itty-bitty thing. They started off swimming in waves. Each wave (divided by age and gender) had a different color rubber swim cap, so it made it easier to identify your swimmer when they finished the swim portion through the rough waves of the bay. I don’t recall exactly, but I do recall that his wave (young, fast men in robin’s egg blue caps) came bobbing to shore first, but not Sheepdog. Then the young, fast women started to swim in. Still no sign of Sheepdog. The older, not-so-fast men, then some kids and even the older women started running out of the cold water. I think a couple of handicapped people swam to shore, as did a woman who was well over 100-years-old (I might be remembering that part incorrectly, but you get my point). Finally, Sheepdog wearily dragged himself up the boat ramp and onto his bike. Satisfied that he did not have to be brought in on a rescue boat, he then took off angrily on his bike as if it were an extension of his own body. He rode like the wind. And he ran like the wind, too, all the way to the finish line back on par with many of the fast, young men. And I stood there with Kid A and Kid B and the diaper bags and the snacks and the double stroller, and I think my parents were there too, and we cheered as loud as our voices would cheer as Sheepdog ran under the marker and clocked his time. It was a grand celebration at that finish line. Sheepdog has also competed in marathons. 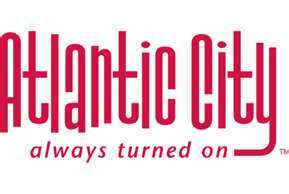 That same year, he ran in the 39th Atlantic City marathon. 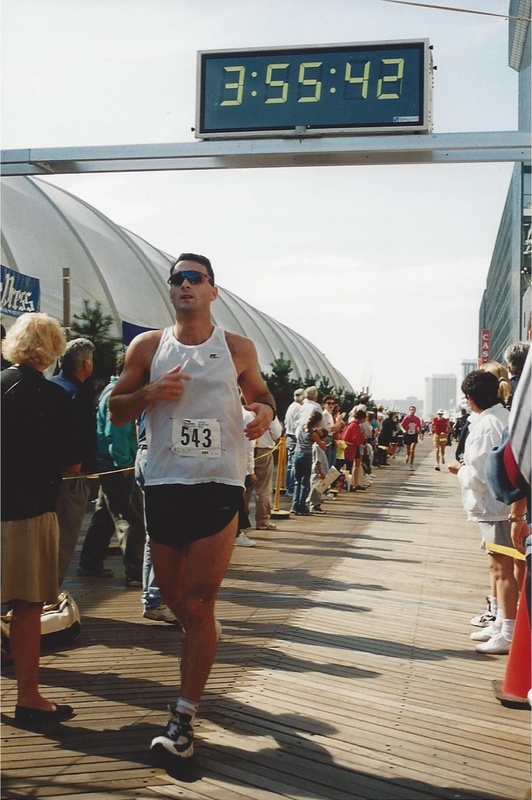 Once again, I stood at the windy finish line with Kid A and Kid B and the diaper bags and the snacks and the double stroller, and we cheered and hollered as he completed twenty-six point two miles of running along the boardwalk and the streets of Atlantic County using only the power of his own mind and body. And he did it in just under four hours. And it was again a grand celebration at the finish line, especially because this time he didn’t almost die in some back bay because of his dinosaur flaw. He went on to run another marathon in Philadelphia after Kid C was born. He trained so as to not die on the swim portion and he “Tri-ed” again a few more times after we moved to Georgia. He has ridden in countless bike races, all over these United States. They are each different but sometimes the races all blur together in my mind. The end is always a grand celebration at the finish line. A celebration of athleticism, of willpower of the human mind, of setting and attaining seemingly impossible goals. And of not drowning. But mostly the finish line is a celebration of people. Yes, I have stood and celebrated at many finish lines. My heart aches for those who were there at the Boston Marathon when the bombs went off. I watched the news in horror, found hope in the helpers and cheered with America when they captured the suspect. Boston may be strong, but I fear they are a little bit harder inside after the events that unfolded last week. I know I wondered if I would ever want to be at any finish line ever again. But then I decided something… I decided that I do still wish to be there. I want to celebrate athleticism and willpower and goals. Mostly, I want to cheer for the people, because mostly, people are good. I will continue to send my kids off to school. I will keep going to the movies. I will continue to live this life that I have been blessed with to the fullest. I will try to be one of the helpers. And I will ALWAYS be cheering as loudly as I can at the finish line. And I hope to see you all there.